Speaker Boehner: 'We're Not Going To Be Perfect Everyday' : It's All Politics Boehner was philosophical about losing the vote to extend several Patriot Act provisions. And he blamed Democrats, many of whom voted for the extension last year when the House was led by Democrats. This time they refused to give Boehner the victory. 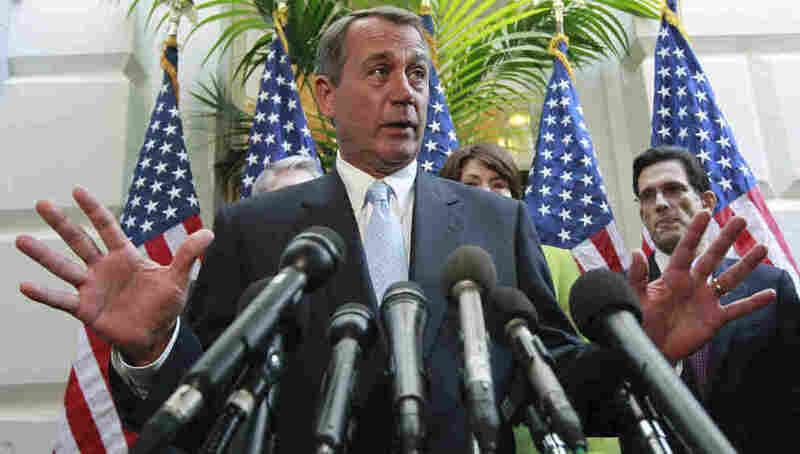 House Speaker John Boehner of Ohio, Wednesday, Feb. 9, 2011. House Speaker John Boehner (R-OH) was philosophical Wednesday about his first significant legislative setback as leader of his chamber, his failure to win an extension of several Patriot Act provisions. You win some, you lose some, he essentially told reporters, speaking of the Tuesday evening vote in which defections by a few dozen Republicans left him on the short end of the vote. While Boehner said nothing ill of the Republicans who voted against the legislation, he implied that Democrats who opposed the extension this year when they didn't in the last Congress might have had less than pure motives. REPORTER: Mr. Speaker — Mr. Speaker? Yesterday, you had your first loss as speaker, extensions of the Patriot Act went down undersuspension. Were you surprised that those went down? And specifically, there were eight freshmen members that were nay voteswho, had they voted yes, could have passed that bill. Is this foreshadowing any problem you have with freshmen votes? SPEAKER BOEHNER: Well, listen, we've been in the majority four weeks. We're going to have — we're not going to be perfect everyday, and if the Democrats who voted for these same provisions last year would have voted for them this year, it would have passed. But we're going to get these extensions of the Patriot Act enacted because it's important to the safety and security of the American people. The provisions the House voted not to extend through Tuesday night's "no" vote on H.R. 514 would have allowed certain law enforcement and national security practices to continue past the Feb 28 deadline. Federal authorities could have continued use of roving wiretaps, access business records and conduct surveillance on lone-wolf terror suspects not part of a larger organization.